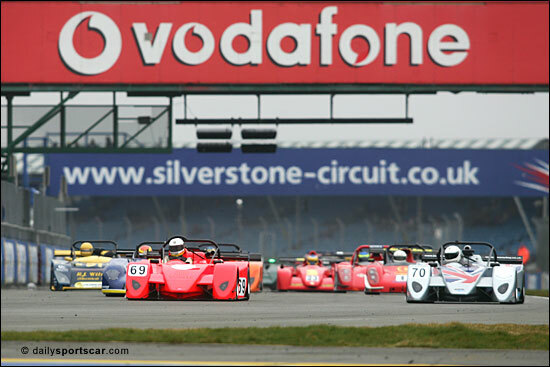 Juno dominated the opening Britsports race of the 2006 season, on Silverstone’s International circuit, filling four of the top five positions, and taking the overall and both class wins in the 110-minute race. 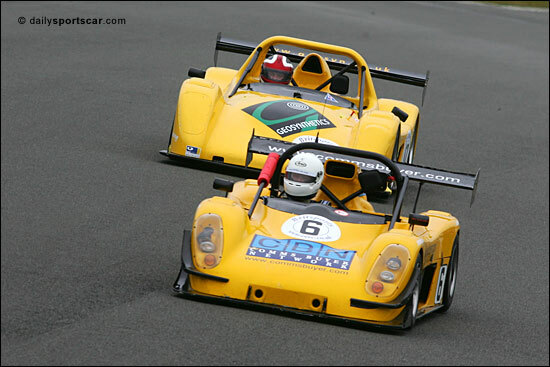 ... followed by international ace Rob Croydon, sharing the RSR Motorsport Juno with Adrian Mardlin. The pair had finished third in the Jarama round of the VdeV Championship the previous weekend, but a transporter breakdown on the return journey meant that the car arrived just in time for the Silverstone meeting, with no time for preparation. In all, 16 prototypes lined-up to take the start of the 110-minute race, by which time squally showers had given way to intermittent drizzle, with a blustery wind feebly attempting to dry the track. Nevertheless, the opening laps saw some frenetic action at the front, with Chris Ward, Andy Schulz, and Jeff Davies circulating as one, and all having a shot in the lead. Six laps in, and Schulz’s silver Juno clashed with the sister car of Davies, leaving the orange machine stranded in the gravel at Priory. 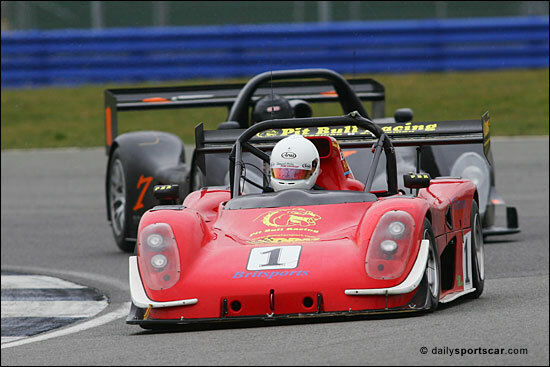 Once recovered, he rejoined the race, but the car was dogged with a misfire thereafter. 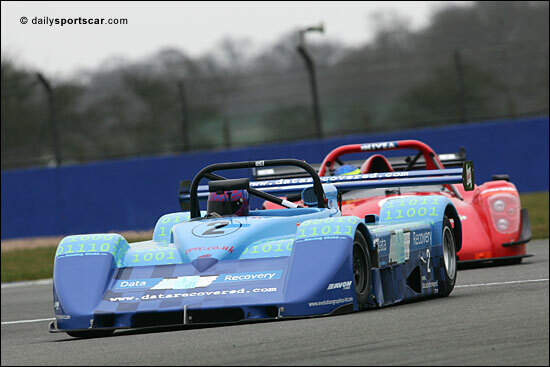 The motorcycle-engined Speads was an early pit visitor, Jay Wheals reporting that the temperature had suddenly shot up. Not willing to risk the engine, the team wisely retired the car, works driver Dave Longstaff forsaking his stint in the second half of the race. Ninety minutes to go, 14 laps on the board, and Schulz, on slicks from the get-go, had a five-second advantage over Rob Oldershaw’s Juno (above), then, a lap down, the stunning PRC of Steve Hodges. 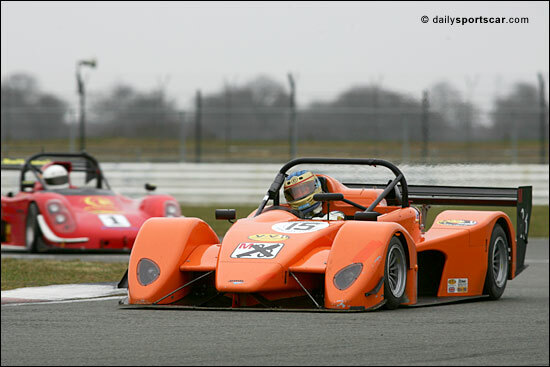 Howard Spooner’s FX-Blower, a variation of the middle east based dual purpose single-seater / sportscar Formula X , had been in and out of the pits, with exhaust problems. “We’ll just use this race as a test session now,” admitted Spooner. Oldershaw was gradually chipping away at Schulz’s lead, and by lap 21 was past, but with the half-way stage of the race looming, it was a sensible time to make the first of two mandatory pit stops, and they dived into the pit lane nose to tail. Richard Gomes relieved Oldershaw, and was out in front of lone-driver Schulz, who exacerbated the situation by stalling. This left Steve Hodges’ PRC in the lead. With 45 minutes of the race left to run, and drizzle dampening the track again, Schulz was back in the lead, with Gomes second, and the PRC third, Will Hodges now at the wheel. 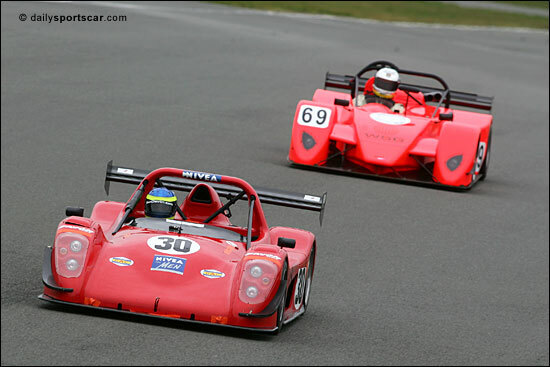 Gone from the race by this point was the Radical of James Richardson and Ben Devlin (#30). 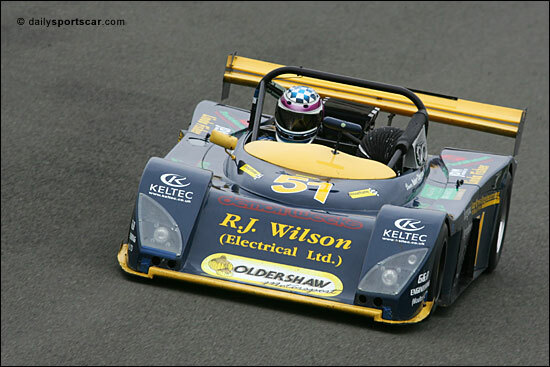 Richardson had endured gear selection problems in his stint, and, stuck in first, Devlin never made it out of the pit lane. With the drizzle setting in, and under half an hour to go, time was ripe for the second round of mandatory stops. Schulz kept hold of his slicks, despite the worsening conditions, and the Hodges PRC changed tyres, but not to full wets. 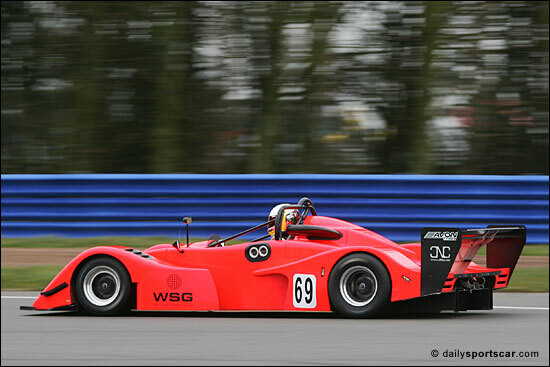 Simon Heaps, up to this point not a significant player in the Pilbeam MP91, now came into his own, donning wet rubber, and, in fifth place and two laps down, circulated eight seconds a lap faster than those in front of him. As the closing minutes counted down, there was pleasure and pain. Heaps dispensed with Mardlin, Oldershaw and Hodges to take a settled second place, and Mardlin himself, in the out-of-the-box RSR Juno, was catching the slowing PRC of Hodges. Slowing, it turned out, because of a gear selection problem, and with little under a quarter of an hour left, the Safety Car was deployed to enable the safe recovery of the smart blue PRC, from the run off area at Becketts. Cruel luck after a promising start from the father and son team. Also in the wars was Rob Oldershaw’s Juno, stuck in the gravel at Brooklands, losing fourth place to the Davies / Briggs works car (#69), though, since the chequered flag was now being made ready, hanging on to fifth. So, with 70 laps completed, car number 70 crossed the line to finish what commentator Brian Jones described as an absorbing and fascinating race. 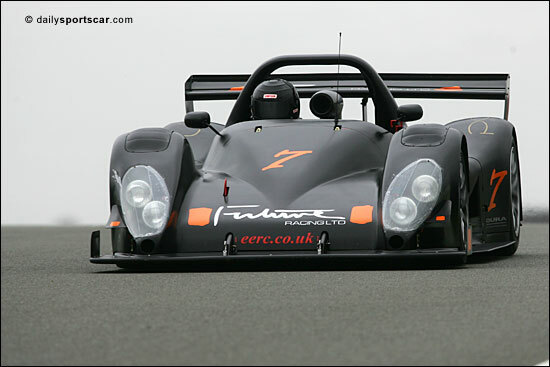 Andy Schulz, in the tricky conditions, had driven superbly alone, after car owner Mike Roberts was called away on an urgent matter. 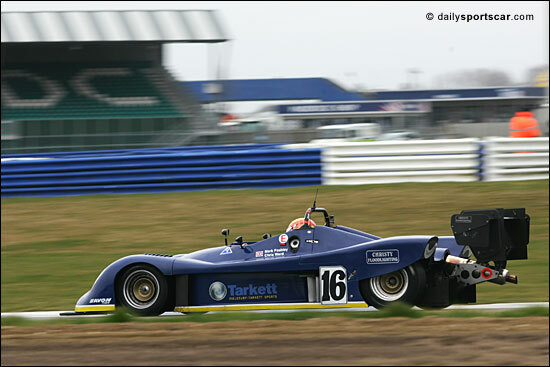 “I was getting understeer in the wet, and still on slicks at the end of the race, so the safety car worried me,” commented Schulz, alluding to the fast progress of Simon Heaps’ Pilbeam. 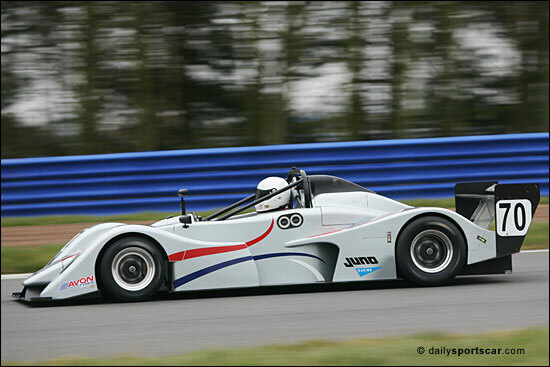 Rob Croydon and Adrian Marlin circulated like clockwork in the RSR Juno, continuing on from their performance in the VdeV, despite little preparation, and the orange Davies / Briggs Juno recovered well from its early contretemps. Polesitters Nick Pashley and Chris Ward slipped backwards with exhaust problems during the race; “We got overall pole, and fastest race lap in Class 2, so something came out of the day,” mused Pashley.